Surrealist painters, robot doubles and an imperial throne that doubled as a toilet are just some of the things that made the ill-fated production so interesting. Dune is a tricky book to translate into a movie. There have been many attempts, and one person - director David Lynch - even managed to succeed in the early 80s. But few attempts, whether they were successful of not, can match the sheer insane ambition of Chilean filmmaker Alejandro Jodorowsky's effort in 1974. While the project never made it past pre-production, a new documentary by Frank Pavich will soon chart its twists, turns, and numerous eccentricities. Author Frank Herbert's book is a rich and detailed tale that weaves politics, religion, ecology and countless other elements into one of the best-loved sci-fi stories ever written. Set tens of thousands of years in the future, the book focuses on Paul Atreides, scion of House Atreides, who is sent to the desert planet Arrakis along with his family to mine the spice Melange - the most important substance in the universe - by order of the Emperor. A conspiracy between the Emperor and House Harkonnen - the Atreides' hated foe for thousands of years - forces Paul to flee into the desert, where he becomes a leader of men, and much more besides. That's really just the briefest synopsis of the book of course; there's so much going on that it's almost impossible to concisely summarize, much less film. Jodorowsky's movie supposedly sidestepped the issue of fitting everything in with a script the size of a phone book and a run time of ten or more hours. What's more, Jodorowsky wasn't afraid to add a few ideas of his own to the project. In Jodorowsky's script, the Emperor was insane, and had an identical robot double. Jodorowsky cast surrealist painter Salvador Dali in the role, who apparently demanded that his fee be $100,000 an hour, and that the Emperor's throne also be a toilet. Jodorowsky reportedly acquiesced to both of these demands. As strange as the project sounds, Jodorowsky was able to attract some fairly well known names, although for many of them, it was at the start if their careers before their most well-known and/or acclaimed work. The team included Dan O'Bannon, who wrote Alien and Total Recall, and H.R. Giger, who designed Alien's iconic xenomorph. The cast was similarly interesting; besides Dali it was to include Orson Welles, Mick Jagger, and David Carradine. 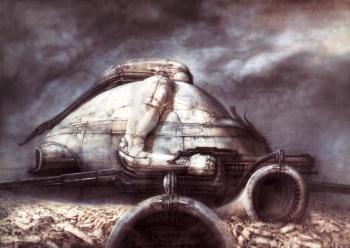 For the documentary, titled Jodorowsky's Dune, Pavich has interviewed the surviving members of the production team in France, Switzerland, and the UK. In the summer, the production will move to the US, to complete the second half of filming. Just a short time spent researching Jodorowsky's production yields some really interesting tidbits of information, so a full documentary should be absolutely fascinating.